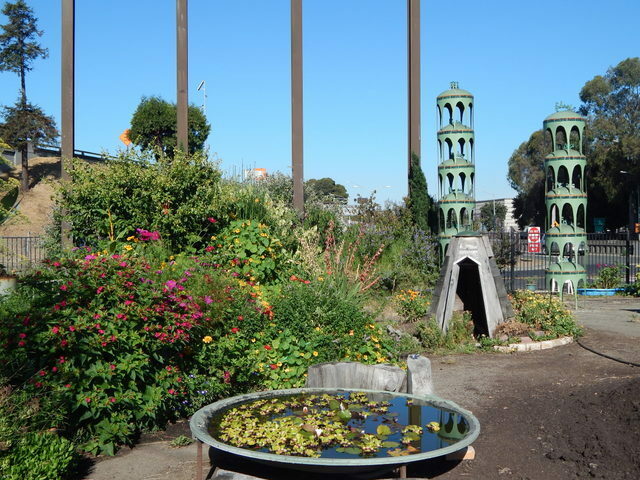 When the abandoned gas station that had been owned by artist Vickie Jo Sowell’s long-time neighbor Big Daddy Green burned down in 2001, the City of Emeryville asked her what she thought should be done with the site. Big Daddy's Complete Rejuvenating Community Garden is the result, the name a riff on Mr. Green's original business, “Complete Mobile Rejuvenation.” Today the garden is one of three sponsored by the city. Change has come slowly and organically to this corner of our city. Located at the east end of the Oakland/San Francisco Bay Bridge, the area was once a critical transportation nexus, but as times and choices shifted it languished for years beneath a maze of freeways and massive billboards. 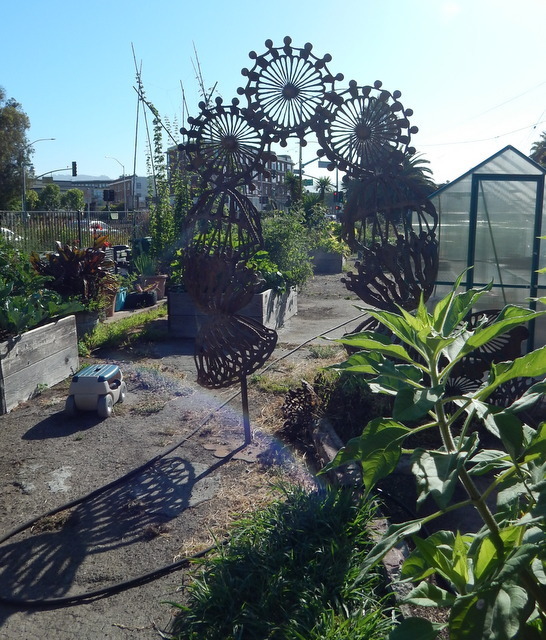 Today, a dozen years on, Vickie is pleased to find this community garden and herself contributing to a happening urban renewal, a true rejuvenation. Art makes the place. From the beginning, Big Daddy's Complete Rejuvenating Community Garden has used art as an integral way to anchor its location. The garden's rounded triangular shape puts its garden plots and artworks in full view from many directions and works as a strong entry marker for our city and for the practice of organic gardening. 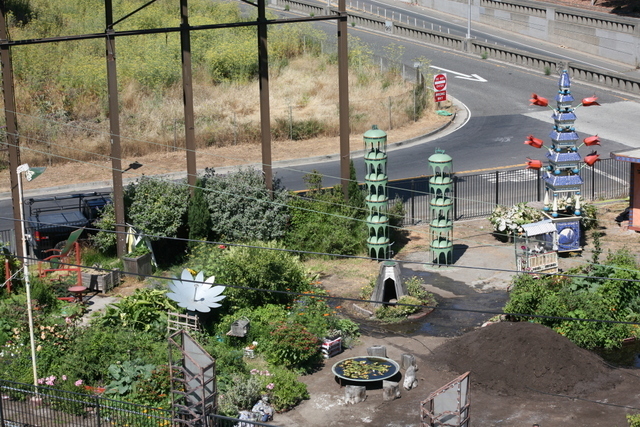 Two large sculptures by Vickie Jo Sowell, the "Peace Towers" and "Delft Vase," establish a happy medium between the towering presence of Interstate-580 and street-level. The elephant in the block is the massive 100-foot-tall structure on the property that supports billboards facing the freeway, one of the most heavily traveled in the world. Beneath them, Big Daddy's sculptures offer a better advertisement for urban replenishment on a human scale. Other artworks within the garden serve as pavilions and pathways that encourage the visitor to wander into varied spaces. 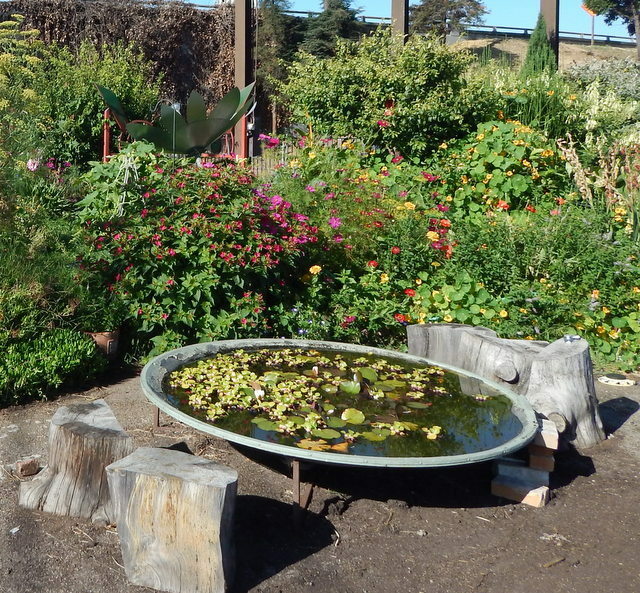 It's an art as well to establish the way that people and events conduct themselves in this multi-use space: where the water is, where the compost pile has been dumped, the garden calendar. Big Daddy’s serves as a meeting place for a variety of urban and global ecology initiatives. 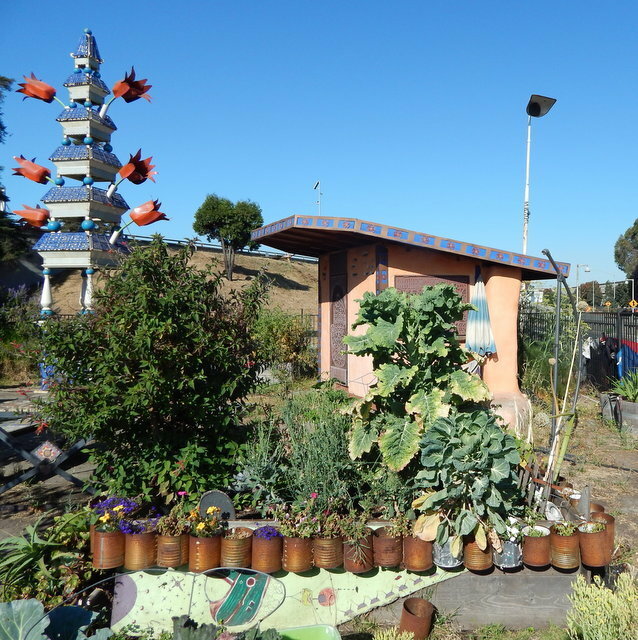 Laney College’s “Eco Art Matters” class has contributed several artworks and the garden’s earthen toolshed was constructed by Merritt College’s Sustainable Architecture class. We’re proud to have hosted events for WEAD, the Women Environmental Artist Directory. We host an annual Earth Day event. The pictures in the gallery and on our Facebook page show some nice views of the garden and activities there, Please come by and visit when you’re in the 'hood! Credits: Wells Fargo Bank Community fund for grant to purchase greenhouse and WEAD (Women Environmental Artist Directory), for ongoing support. 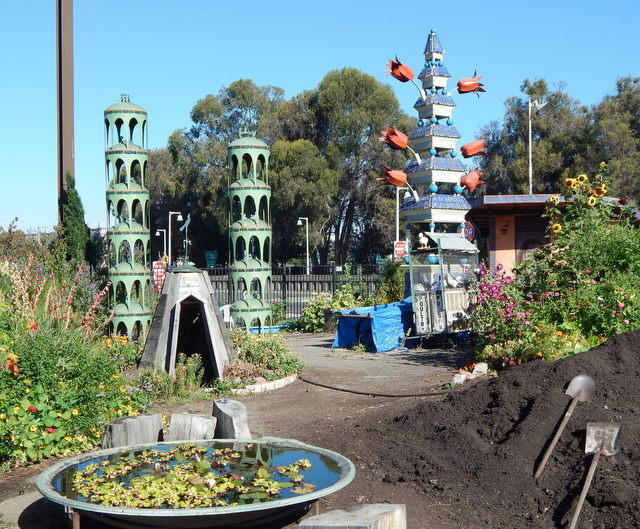 Additionally, the City of Emeryville Community Organic Gardens program for their support. An alternate view of the tool shed, with "Delft Vase," a sculpture by Vickie Jo Sowell, visible in the top left. View from Above—Garden friend and photographer Minoosh Zomorrodinia puts Big Daddy’s in perspective. 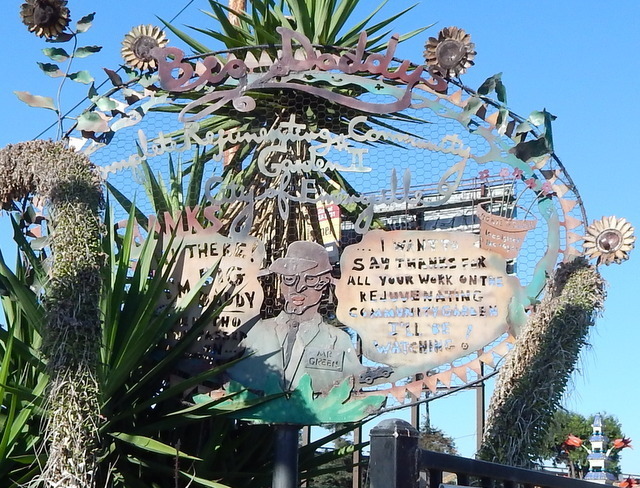 A whimsical entry sign features the namesake of Big Daddy’s Complete Rejuvenating Community Garden. Personal enrichment through growing things. Helping balance our presence in the urban environment. Increasing awareness of important environmental issues and organic gardening. A place of beauty and art. The three legs of the large billboard located in Big Daddy's Complete Rejuvenating Community Garden are seen next to "Peace Towers," one of the sculptures by Vickie Jo Sowell that are located in the garden. 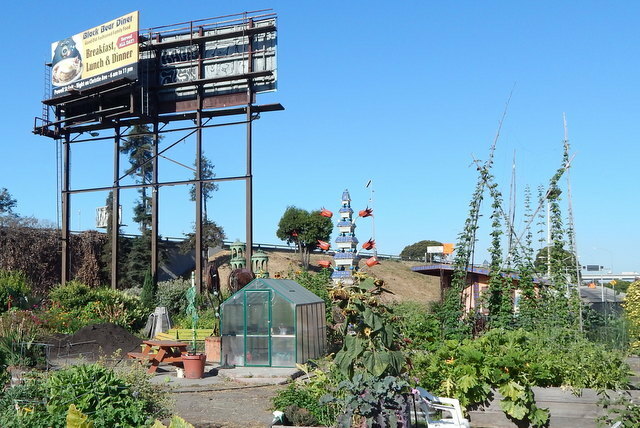 A view of the billboard that hovers over Big Daddy's Community Garden, right next to the Interstate 580. A lovely relaxing niche in the garden. 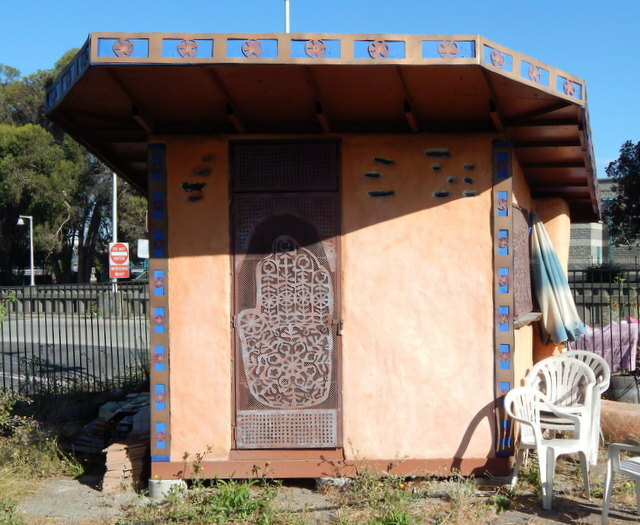 Garden shed was constructed of earth-friendly materials by Merritt College’s Sustainable Building class. 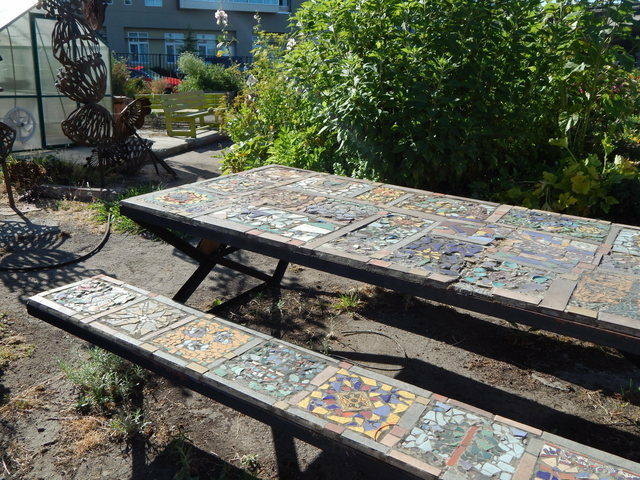 Kids young and old contributed to this tile mosaic table design. “African Daisy,” sculpture by Vickie Jo Sowell. That’s the greenhouse contributed by the Wells Fargo Bank Community outreach fund on the right.